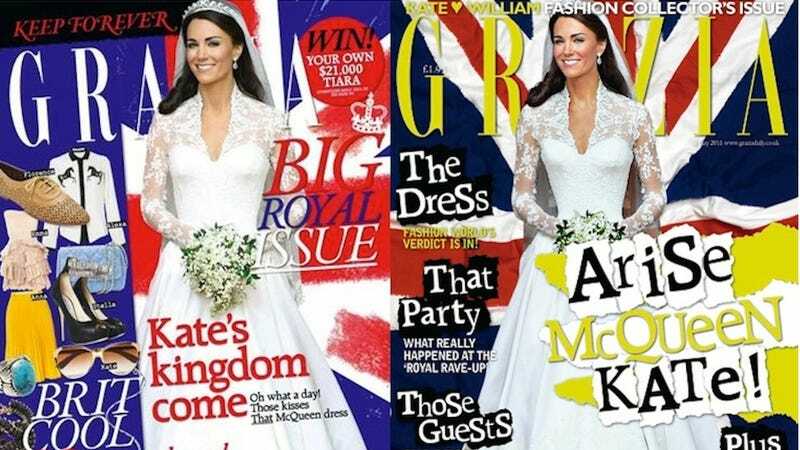 British glossy Grazia swore that it didn't put Kate Middleton on a Photoshop diet for its Royal Wedding cover, despite unmistakable visual evidence to the contrary. Now the magazine has been forced to explain — unsatisfactorily — in an editor's note compelled by the UK's Press Commission. We pointed out in May that the already-very-slim Duchess of Cambridge got a few inches lopped off her waist for Grazia's cover. They reacted indignantly, issuing a statement saying, "Grazia prides itself on being a publication that champions women and women's bodies, and we have no reason to make Catherine Middleton appear thinner." They admitted to taking out Prince William and altering the arm that Kate had extended to him. But an altered arm has nothing to do with a torso that is demonstrably Barbie-fied. Especially when Grazia's Australian edition, seen above next to the British one, had no problem tweaking the arm without changing her waist. Since then, one Edward Hellewell filed a complaint with the UK Press Complaints Commission, which in turn called the following a "resolution." Following a letter received from a Mr H about our royal wedding issue, Grazia magazine would like to clarify the process that led to our final cover image of the Duchess of Cambridge. We wanted a great image of the Duchess on her own, but all the photographs had the Duke in too. So we asked our reproduction house to remove him from the picture (common practice among glossy magazines). This would have left the Duchess with only one arm, so they copied over her arm to complete the picture. We would like to reassure all our readers that we did not purposely make any alterations to the Duchess of Cambridge's image to make her appear slimmer, and we are sorry if this process gave that impression. Grazia takes the issue of women's body image very seriously and we would never 'slim down' a picture of a female role model. Wait, what? How does one magazine in the UK inadvertently get a wildly different torso result with one arm rejiggering than another that did the same thing in Australia? (Must be that weird upside-down thing they have). If it was an accidental cut-out issue, how did no one notice before it went to press? Sorry, never mind — must just be our lying eyes.